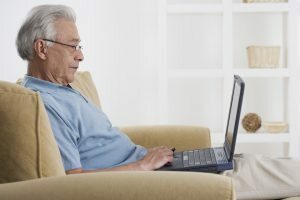 If you are 60 years and over and have never taken a computer course, you may be feeling out of touch with the world today. We recommend that you participate in our computer courses. We have been successfully offering computer courses for eleven years. Our computer classes are very popular; five years ago we only had one class at a time, now they are so much in demand that we have a selection of levels, offered at different times during the week. We are operating our classes with very new lap top computers and Tablets. It is never too late to start. A lot of business and social activities are conducted on-line. When it is snowy and slippery outside, you may not feel like leaving your house but you still need your groceries or to go to the bank. Perhaps you feel that you have relied too much on your family members to help out. It is important to keep your independence and to learn at least the basics about information technology. You may want to learn the basics about how a lap top or a Tablet functions, or even how to use all the functions of the cell phone a family member gave you. With all the different devices on the market today, we know that buying the right electronic device can be confusing. We recommend that you take our computer basics program, where you have the opportunity to try out different devices and eventually buy what you feel most comfortable with for home use. If you enrol in one of our programs, you will learn in a social setting, in an interesting location (at our office or library) and with other seniors. This way, you not only learn about computers, you will also make friends and socialise. •- opening your own email account and communicating with friends, family and business personnel. •- registering on a dating site ……………..and the list is truly endless. If you participate in our tablet training program, ‘’BEYOND THE LIVING ROOM IN SECONDS’’, you will feel empowered and will learn to stay in touch with the world around you. We will be more independent and will stay connected to your community, friends and family. We have the expertise to help you make this progress. This project is funded in part by the Government of Canada under the New Horizons for Seniors for the year 2016-2017. If you have already learned how to use computers or to use a Tablet, we encourage you to volunteer; we need you to help us teach other elders who are just starting. This is a great way to practice and to always remember what you have learned. We offer our courses in Laval, Montreal and in Longueil. Our classes are ongoing. Contact us for additional information or to register. Contact us.